For other uses, see Blade (disambiguation). Artwork for the cover of Strange Tales: Blade vol. 2 #3 (January 1999) Art by Bart Sears. Blade (Eric Brooks) is a fictional character appearing in American comic books published by Marvel Comics. Created by writer Marv Wolfman and penciller Gene Colan, his first appearance was in the comic book The Tomb of Dracula #10 (July 1973) as a supporting character. The character was portrayed by Wesley Snipes in the films Blade, Blade II and Blade: Trinity and by Sticky Fingaz in the television series Blade, both set in the Blade franchise. Blade was introduced as a supporting character in Marvel Comics' The Tomb of Dracula #10 (July 1973), written by Marv Wolfman and penciled by Gene Colan. The artist recalled in 2003, "Marv told me Blade was a black man, and we talked about how he should dress, and how he should look – very heroic looking. That was my input. [...] The bandolier of blades – that was Marv's idea. But, I dressed him up. I put the leather jacket on him and so on". Colan based the character's features on "a composite of black actors" including NFL football star-turned-actor Jim Brown. He initially sported 1970s style afro hair and wielded teak bladed knives. Blade appeared in most issues #10–21, with additional appearances in #24 and 28 (altogether ranging from July 1973 – Sept. 1974). I knew if I let him, Blade would eclipse the other characters so I pulled him back and let original supporting characters Rachel, Frank and Quincy shine. I also wasn't happy with my Blade dialogue, so I pulled him out of the book for awhile — I think almost a year — and when I brought him back I played him a bit straighter. The early Blade dialogue was cliche 'Marvel Black' dialogue. Later on, I tried to make him more real. But it took growing up as a writer. Outside Tomb of Dracula, he fought the scientifically created vampire Morbius in the latter's series in Adventure into Fear #24 (Oct. 1974), in a story written by Steve Gerber and penciled by P. Craig Russell. Blade's first solo story came in Marvel's black-and-white horror-comics magazine Vampire Tales #8 (Dec. 1974), in an 11-page story by Wolfman and penciller-inker Tony DeZuniga. This feature continued in the following issue (Feb. 1975), with Wolfman and Chris Claremont co-scripting. Blade then appeared in a 56-page solo story in the black-and-white showcase magazine Marvel Preview #3 (Sept. 1975), written by Claremont, with two chapters each drawn by DeZuniga and by Rico Rival. A six-page backup story by Wolfman and Colan followed in Marvel Preview #8 (Fall 1976). Blade next came into prominence in the 1990s, beginning with Ghost Rider #28 (Aug. 1992), in the Midnight Sons imprint that included issues of Darkhold: Pages from the Book of Sins, Ghost Rider, Ghost Rider / Blaze: Spirits of Vengeance, Midnight Sons Unlimited, Morbius, and Nightstalkers. Blade co-starred in the 18-issue Nightstalkers, and appeared with that team in a story in the anthology Midnight Sons Unlimited #1 (April 1993). He appeared in two solo stories, in Midnight Sons Unlimited #2 and 7 (July 1993 and Oct. 1994). Blade's origin from Marvel Preview #3 (Sept. 1975). Art by Rico Rival. Following the cancellation of Nightstalkers, Blade debuted in his first color-comics series, Blade: The Vampire Hunter #1–10 (July 1994 – April 1995), written by Ian Edginton (with the last two issues by Terry Kavanagh) and penciled by Doug Wheatley. Blade next appeared in a 12-page inventory story in issue #1 (Feb. 1997) of the short-lived black-and-white anthology series Marvel: Shadows and Light. He then starred again in two solo one-shots: Blade: Crescent City Blues (March 1998), by writer Christopher Golden and penciller and co-creator Colan; and Blade: Sins of the Father (Oct. 1998), by writer Marc Andreyko and penciller Bart Sears. Marvel next announced a six-issue miniseries, Blade (storyline: "Blade: Blood Allies") by writer Don McGregor and penciller Brian Hagen, but only #1–3 (Nov. 1998 – Jan. 1999) were published. Marvel published a different six-issue miniseries later that year, Blade: Vampire Hunter (storyline: "Chaos (A)"; Dec. 1999 – May 2000), written and, except the last two issues, penciled by Bart Sears. The next ongoing series, Blade vol. 2, by writer Christopher Hinz and artist Steve Pugh, ran six issues, published by Marvel MAX in 2002. Blade vol. 3, by writer Marc Guggenheim and penciller-inker Howard Chaykin, ran 12 issues (Sept. 2006 – Aug. 2007). The final two pages of the last issue were drawn by co-creator Colan. Blade also starred in two promotional comic books: Blade ½ (1999) by writer-artist Sears and inker Bill Sienkiewicz, bundled with issues of Wizard: The Comic Magazine #2000; and Blade: Nightstalking (2005), a 22-page story by writers Jimmy Palmiotti and Justin Gray and penciller Amanda Conner, based on New Line Cinema's Blade films, and bundled with the Blade Trinity Deluxe Edition DVD. Additionally, the second Blade movie was adapted as the Marvel comic Blade 2: Bloodhunt — The Official Comic Adaptation (April 2002) by writers Steve Gerber and David S. Goyer and penciller-inker Alberto Ponticelli. Blade joined the cast of Captain Britain and MI: 13 beginning with issue #5 (Nov. 2008). In 2015, it was announced that Tim Seeley and Logan Faerber would be launching a new Blade series, starting in October 2015, as part of Marvel's post-Secret Wars relaunch. However this book has since been delayed for an unspecified time. Marvel Preview #3 (Sept. 1975). Painted cover art by Gray Morrow. Blade (born Eric Brooks) was born in a whorehouse in the Soho neighborhood of London, England in 1929. Eric's mother, Tara Brooks, was a prostitute at Madame Vanity's Brothel. When Tara experienced severe labor complications, a doctor was summoned who was in actuality Deacon Frost, a vampire who feasted on her during Eric's birth and killed her. However, this inadvertently passed along certain enzymes in his own blood to the infant. This resulted in Eric's quasi-vampiric abilities, including a greatly prolonged lifespan and the ability to sense supernatural creatures, as well as an immunity to complete vampirism. Brooks' fellow prostitutes drove off Frost before he could kill the infant as well. Eric grew up living at Madame Vanity's, and at age nine, returning home from school one December, he saw an old man being attacked by three vampires. Eric helped the old man, who used a silver cane to kill the vampires and fight off the attackers. The man was Jamal Afari, a jazz trumpeter and vampire hunter who then moved into Madame Vanity's and trained the young Eric in both music and combat. Blade was soon able to defeat many of the weak, younger vampires that he and Afari found in abundance. Eric became an Olympic-level athlete and a formidable hand-to-hand combatant, with an expertise in edged weapons such as knives and daggers so notable that it earned him the nickname "Blade" among both his fellow hunters and the vampires they opposed, who began to fear the young hunter. Blade's victories made him cocky. He joined a street gang, the Bloodshadows, headed by Cyrus Cutter, later killed by Blade in a knife fight caused by Blade's disapproval of Cutter's actions as leader. Glory Anah, Cutter's girlfriend, later became Blade's. Having gone to London, where for months they hunted vampires, demons, and warlocks, the group encountered a much older and more powerful vampire than any Blade had met before, named Lamia. Blade barely defeated Lamia, with the other members of the group being killed, except Glory, who was turned into a vampire whilst Blade was down. Although Glory subsequently refused to kill Blade in recognition of their relationship, she warned him never to look for her or she would kill him. The tragedy of the experience left Blade more determined than ever to dedicate his life to the complete extermination of vampires. Afari himself later fell prey to Dracula, the first occurrence in an ongoing battle between Dracula and Blade. Blade mercy-killed his mentor after Afari rose as a vampire, and tracked Dracula back to Europe, Asia Minor, and Asia, staking him many times, but never completely destroying him. In China, Blade joined Ogun Strong's vampire hunters, which included Azu, Orji, and Musenda. Together, they staked Dracula again. Dracula survived, and killed all the hunters except Blade and Musenda, who eventually retired from vampire hunting. Orji had created a lasting impression on Blade with his use of wooden daggers to combat vampires, leading to Blade adopting that weapon as his preferred arms. Consumed by grief for his fallen comrades, Blade resumed his quest alone. Nightstalkers #3 (Jan. 1993): The "revamped" costume. Cover art by Ron Garney and Tom Palmer. Blade eventually located Dracula in Paris, where he first encountered the vampire hunter Quincy Harker, son of Jonathan Harker, whom he knew by reputation, and Harker's vampire hunters: Rachel van Helsing, great-granddaughter of Abraham Van Helsing; Taj Nital; and Frank Drake. Because of his mercurial temperament, Blade had a strained but steady relationship with the group, allying himself with them on several occasions. Later, after an unsuccessful battle with Dracula, Blade realized he was immune to turning from a vampire's bite. Armed with this knowledge, he parted company with Harker and went after Deacon Frost alone. Blade later battled Dracula in London, as well as Morbius, the Living Vampire, and the Legion of the Dead, who framed him for murder. Blade also destroyed a band of vampire children. Blade's hunt for his mother's killer led him to Boston, Massachusetts, where he allied with Dracula against Doctor Sun. Following this battle, Dracula withdrew and Blade again set out on his own. He eventually encountered Hannibal King, a private detective whom Deacon Frost had turned into a vampire. While initially distrusting King, Blade teamed up with him to hunt Frost. Blade and King fought together against Blade's evil doppelgänger, who absorbed the real Blade. King enlisted the help of Daimon Hellstrom, the so-called Son of Satan, who exorcised Blade from the doppelgänger and killed it with King's help. Blade and King eventually caught up with Frost, who had created an army of vampiric doppelgängers, one for each of his victims. Together, they shut down Frost for good, destroying Frost, and forging a lasting friendship. Blade, Rachel van Helsing, and Harold H. Harold later confronted Dracula. Blade also saved Musenda's wife from becoming a vampire. In later years, Blade, along with King and Drake, became a frequent ally of the sorcerer Doctor Strange, and the three assisted Strange in battles with Dracula and the Darkholders and assisted in the casting of the Montesi Formula, which for a time destroyed all vampires on Earth. Blade, King, and Drake then formed the private detective agency Borderline Investigations, Inc. to combat supernatural threats. Alongside Doctor Strange, the three detectives battled the Darkholders again. Blade also rescued his close friend Safron Caulder from the Darkholders. The agency discontinued after Drake left and Blade was committed to a psychiatric hospital following a battle with a temporarily resurrected Dracula. Doctor Strange later arranged the release of Blade so that he could join Drake and King in reforming Borderline, Inc. as the Nightstalkers. Blade, King, and Drake were hired by the demonic Lilith to kill the second Ghost Rider and the non-powered John Blaze. The three Nightstalkers battled Meatmarket. The Nightstalkers then teamed with Ghost Rider, Blaze, Morbius, Doctor Strange, and the Darkhold Redeemers to battle Lilith and her Lilin. The Nightstalkers also battled other threats, such as HYDRA's DOA. Upon the eventual weakening of the Montesi Formula and the return of vampires, Blade encountered and staked a former ally, a now-vampiric Taj Nital, and survived a battle with the vampire lord Varnae in which Drake and King appeared to have been killed. Peter Parker: Spider-Man #8 (Aug. 1999): Morbius transforms Blade into a Daywalker. Cover art by John Romita, Jr. & Scott Hanna. A solo vampire-hunter once again, Blade briefly joined forces with the mystic Bible John Carik, and encountered a vampire impersonating Deacon Frost and a once-again resurrected Dracula. Later, in New Orleans, Louisiana, Blade discovered that Hannibal King had survived, and the two joined forces to defeat a genuinely resurrected Frost. Blade remained active in New Orleans, defeating the vampire Ulysses Sojourner and his own former ally, Morbius, the Living Vampire, who was under Sojourner's mental thrall. Blade followed Morbius to New York, where, while teamed with Spider-Man, Blade was bitten by Morbius. Blade's blood enzymes reacted unexpectedly with Morbius's unique form of vampirism to grant Blade many vampire strengths while eliminating weaknesses inherent to a vampire, most notably the weakness to sunlight. It was at this time that Blade assumed the unofficial title of "Daywalker" among his prey. The United Nations-sanctioned espionage agency S.H.I.E.L.D. sought to use Blade's blood for Project: Silvereye, an attempt at cloning vampire operatives. Blade and the vampire-hunting twins Mosha and Mikado shut down the project. Blade later joined Noah Van Helsing, actually Noah Tremayne, Rachel Van Helsing's adopted cousin, and several vampire hunters worldwide to stop Dracula from becoming a genuinely god-like vampire lord. Blade then returned to New Orleans. Blade re-encountered Dracula, and appeared to fully destroy the vampire once again, aboard the S.H.I.E.L.D. Helicarrier Pericles V. Unbeknownst to Blade, his wealthy father, Lucas Cross, had been responsible for Dracula's most recent resurrection. Cross later kidnapped Blade and attempted to force Blade to feed on a virgin girl in an attempt to fulfill a prophecy. Blade escaped after biting through his own hand. Later, Blade would feed on a virgin after biting an evil vampire priest, Draconis. In exchange for undertaking a time travel adventure for the supervillain Doctor Doom, Blade received from Doom an elixir that would purportedly cure a vampire of thirst for human blood but would also remove the bloodlust vampire hunters get for killing the undead. At the end of the series, Blade gave Hannibal King the elixir. During this time travel mission, Blade fulfilled another part of the prophecy by freeing his imprisoned father. During the Civil War storyline, in which the superheroes of the Marvel Universe were split over the Superhuman Registration Act, Blade registers and begins cooperating with S.H.I.E.L.D. This alliance allowed Blade access to S.H.I.E.L.D. tech, gaining himself a "gun hand" to replace his missing one. Blade completes a prophecy he believes would give all extant vampires back their souls, but which instead returns to existence every vampire that had ever been killed. Blade next leads a group of superhuman black-ops agents funded secretly by the U.S. government, called the Vanguard, of which even the president is unaware. During his time with this squad, Blade receives a cybernetic replacement hand. The squad disbands after their cover is compromised, and Blade returns home to the United Kingdom to join MI-13 in its fight against supernatural evil. He soon afterwards stakes his new teammate, the vampire hero Spitfire. Blade and Spitfire clashed again with each other in a fierce battle, but the two were forced to work together and seemed to have formed an unlikely friendship. Upon completing their first mission together, Blade attempts to apologize to Spitfire for trying to kill her, but before he could finish she kisses him. During the "Curse of the Mutants" storyline, Blade appears in San Francisco to assist the X-Men in capturing a vampire specimen for the X-Club. He confirms Dracula's death and reveals that his son Xarus is the new Lord of Vampires, having united all of the vampire sects under a single flag. He immediately objects to Cyclops's plan to resurrect Dracula stating "You don't dig up Hitler to get rid of Saddam Hussein". The conflict concluded with Dracula being resurrected despite Blade's objections. Blade attempts to kill the now-vampire Jubilee, but is forced to withdraw after a stand-off with Wolverine, who refuses to allow her to be staked, even as Blade warns the X-Men that they will eventually have to kill her. Blade was later revealed to have been using the Ronin identity as part of the Mighty Avengers team. In order to prepare for his next TV program, Mojo paired Blade up with Doctor Strange, Ghost Rider, Manphibian, Man-Thing, and Satana where he formed the Avengers of the Supernatural. He mind-controlled them and had them fight the Avengers Unity Division. Both groups managed to break free from the mind-control and returned to their world after preventing Ghost Rider from using his Penance Stare on the inhabitants of Mojoworld. Blade later appears in a small town hunting down a necromancer and ends up confronting Gwenpool, who was hired to kill him. After Gwenpool explains that the dead residents are living peacefully, Blade leaves after he gives her his cellphone number but is called back when Gwenpool discovers that the mayor/necromancer is actually killing children to keep his undead citizens alive. During the "Secret Empire" storyline, Blade was shown to have been trapped in Manhattan when it was isolated by a Darkforce dome. Due to the vampire attacks at the time, Blade takes advantage of this by killing every attacking vampire to protect the humans. Blade was later captured by an army of vampires and imprisoned until he was freed by Wasp. He took up Black Panther's offer to join the Avengers. Due to an enzyme in his bloodstream resultant from his mother's being bitten by a vampire while giving birth to him, Blade is immune to the bites of typical, supernatural vampires. In certain instances, he also appeared immune to vampire hypnosis as well. He lacked superhuman physical attributes, however, and relied solely on his considerable skill and determination until Morbius, an atypical, scientifically created vampire, bit him and Blade was turned into something resembling a dhampir. Blade possesses superhuman strength, stamina, speed, agility, heightened senses, and a rapid healing factor that attacks any alien substances (chemicals/viruses) in his body and eliminates any chance of him being rendered helpless or maimed from the inside and is unaffected by daylight and most other traditional vampire weaknesses. He also ages very slowly (although he is not immortal) and can preternaturally sense supernatural activity. Blade is a master martial artist mastering styles like boxing, capoeira, escrima, jeet kune do, hapkido, jujutsu, Shotokan karate, kung fu, and ninjutsu. [volume & issue needed] He is also a skilled swordsman, marksman, and street-fighter. He is adept in the usage of throwing knives. He is highly knowledgeable about vampire lore as well as the supernatural. In the films and television series, Blade originated from Detroit, Michigan. Blade is depicted as having all of a vampire's strengths and none of the weaknesses, except for bloodthirst. Blade attempts to suppress the thirst with a serum, but during the first film his body develops a resistance to it. At the beginning of the second film, it is stated that Dr. Karen Jenson, from the first film, improved the serum, presumably in the time between the two films. Although he does not want to drink blood, he has been shown to be capable of it; prior to the development of the serum, Whistler noted that he found Blade as a teenager when Blade was feeding on the homeless, with Blade ingesting blood during the first and second films when in a position where he was badly injured and needed to be back at full strength as soon as possible. Blade's half-vampire physiology results in him being completely immune to silver, garlic, and sunlight. Blade has superhuman strength, speed, stamina, agility, reflexes, and senses. He also has a healing factor that allows him to heal completely from wounds overnight, although in the first and second films he was forced to drink blood to accelerate his usual healing abilities when faced with an immediate threat and too badly injured to confront it on his own. It is also mentioned in the first film that he ages like a human, while vampires age much slower. He is a master of martial arts, practices meditation, and can speak Czech, Russian, and to a degree the vampire language, and he has a great deal of knowledge about hunting vampires. It is seen in the television series that, while he is only half-vampire, Blade's saliva still produces the enzyme that turns humans into vampires. According to his earliest appearances in the original The Tomb of Dracula comics, Blade relied on teakwood daggers which he used to impale opponents, and a variety of mahogany stakes. He was an excellent hand-to-hand combatant and knife-fighter. Later comics upgraded his arsenal significantly over the years, including a variety of different bladed weapons ranging from long swords to katanas, as well as guns, flamethrowers, and UV and silver-based weapons. He relies mainly on a double edged sword he carries on his back. He has also had some success with improvised weapons such as stakes made from snapped brooms and, after losing his hand, a replacement appendage made from duct tape and a pointed stick. He would replace this with a new machine gun-esque firearm used in place of his missing hand, which responds to different muscle twitches as an indication of reloading and firing, among other functions (including a grappling hook, which Blade describes as his "favorite feature"). It also uses three different kinds of ammo. This weapon was created by S.H.I.E.L.D. Blade also had an arsenal of EMP grenades. Much in the same way as in the comics, in the movie series, Blade employs a stylized double edge sword as one of his main offense and defense tools. Although not much detail is specified in the comics about the composition of the sword, in the films, it is equipped with an acid-etched titanium blade that has a security feature that will release blades into the wielder's hand after a set time. This is aborted by Blade or others who know of the system by pushing a hidden switch in the sword's hilt. The movies also depict him wielding varieties of throwable "glaives" (boomerang- or chakram-like weapons which return when thrown), different knives, silver stakes, and firearms. He also uses specialized weapons, such as throwable injector canisters filled with anticoagulant which is explosively lethal to vampires, and extendable injector spikes worn on the back of the hand. In addition to all his above skills and powers, Blade's swordsmanship in particular is shown in Marvel Anime to be especially advanced. Blade's sword-style revolves mainly around his mastery of Yagu Shinkage-ryu, a kenjutsu art that can unleash powerful shockwaves or transparent wind blades from his sword swings, allowing him to blast or slice respectively his opponents from a distance. The Yagu Shinkage-ryu also has three principle Yagyu techniques. The first technique "The First Blade: Residual Moon", draws a small circle with the tip of his sword, producing a perfectly tangible after-image of himself for diversions. The second technique "The Second Blade: Phantom Moon", involves a high-speed spin, allowing Blade to launch an omnidirectional slash in rapid succession with such intensity that it sets his strike ablaze. The final technique, "The Third Blade: Chaotic Moon", launches several shadow blades around the opponent, hiding the user's attack path with little chance of being noticed. Nick Fury explained to Blade and those who joined the resistance aboard the S.H.I.E.L.D. Helicarrier how serious he believed the situation to be; that it was the end of the world. He also explained that whatever the histories of those assembled, they were all on the same side. However, Blade was later seen as one of the infected heroes. An alternate universe Blade of the Ultimate Marvel imprint appeared in Ultimate Spider-Man #95, and had a cameo in the non-canon Ultimate Spider-Man Special. This version, called "The Daywalker" by the Bugle, has numerous small scars across his eyes and cheeks. Spider-Man met Blade when he was hunting a vampire in an alley. Believing Blade to be a crazed gunman, Spider-Man webbed him and tended to a person who he thought was an ordinary civilian, until the vampire attacked him. Blade freed himself and staked the creature, saving Spider-Man from being bitten. Blade then threatened Spider-Man with his superior strength and menacing vampiric appearance, that if he ever attacked him again, he would "eat [his] heart for breakfast!" Shaken by this encounter, Spider-Man later took Blade's discarded wooden stake as a memento of his discovery of the existence of vampires. This experience also later helps him when trying to save Ben Urich from becoming one. Blade is one of the many heroes recruited by Nick Fury in Ultimate Comics: Avengers. When vampires started infecting superheroes, going from street-heroes such as the new Daredevil, to major heroes such as Nerd Hulk, and even Captain America, Blade became the center of attention as he infiltrated the Triskelion, where he fought the vampire Captain America. After repelling Captain America, Blade was taken into custody by S.H.I.E.L.D. and interrogated on the nature of the vampires and who was behind this. He explained that this was orchestrated by Anthony, another vampire hunter like Blade, who was turned into a vampire and put his mind and strategy into infecting the superhero community in order to dominate the world. As S.H.I.E.L.D. and the Avengers were preparing to fight against the vampires, Blade was incarcerated below the Triskelion as he couldn't be trusted until the situation is over. When the vampires assaulted the Triskelion, Blade was let out by his handlers in confronting the vampires Daredevil and his former master Stick. He was forced to retreat from the vampires as Stick was armed with Iron Man's armor before being subdued and prepared to be beheaded by Daredevil. Fortunately, a cured Captain America teleported the Triskelion to a daylight Iran where the vampires were incinerated, saving Blade in the process. Nick Fury managed to convince Blade to join his Avengers by promising to deliver to him the recently captured Deacon Frost, the vampire who killed his mother and is responsible for his condition. While attempting to intervene on an illegal sale of S.H.I.E.L.D. Super-Soldiers, the Avengers were attacked by Tyrone Cash. However, Blade was able to hypnotize him before he could cause any real threat. Cash revealed that he was working for Carol Danvers. During the main battle between the Avengers and the New Ultimates, Blade managed to capture Danvers briefly before he was intercepted by the Black Widow. Iron Man intervened to help Monica; however, he crushes Blade, not realizing that Blade does not have super-human invulnerability. After being arrested by the New Ultimates, Blade and the rest of the Avengers take Tyrone Cash's serum and they gain massive strength and bulk bodies. When they confront Gregory Stark, he easily overpowers them with his nanite-based powers and sends them over the edge of the U.S.S. Jimmy Carter. They later join the New Ultimates on their mission to South Korea to settle the civil unrest which Gregory engineered. In 1997, on the eve of the impending release of the Blade motion picture, Marv Wolfman sued Marvel Characters Inc. over ownership of all characters he had created for Marvel Comics, including Blade and Nova. A ruling in Marvel's favor was handed down on November 6, 2000. Wolfman's stance was that he had not signed work-for-hire contracts when he created characters including Blade and Nova. In a nonjury trial, the judge ruled that Marvel's later use of the characters was sufficiently different to protect it from Wolfman's claim of copyright ownership. IGN ranked Blade as the 63rd greatest comic character stating that Blade is the most iconic hero to spring from the period of monster-themed stories. UGO Networks placed Blade as one of the top heroes of entertainment quoting that "Blade has to get props for being the most obscure Marvel character to ever get a film deal... and television deal, too!" Blade was ranked 4th on a listing of Marvel Comics' monster characters in 2015. Blade appeared in the 1990s Spider-Man animated series episode "Neogenic Nightmare: Chapter 9: Blade the Vampire Hunter", voiced by J. D. Hall. In this version of his origin, he was the son of a vampire man who had fallen in love with a human woman, who left Blade in foster care before she became a vampire herself. 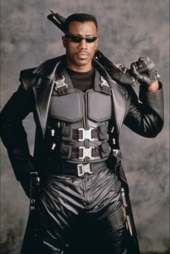 Blade also appears in the episodes "The Immortal Vampire", "Partners in Danger, Chapter 7: The Vampire Queen", and the season five episode "Secret Wars, Chapter 2: Gauntlet of the Red Skull". Blade, a 2006 live-action series that aired on Spike TV and starred rapper/actor Sticky Fingaz as Blade. The series dealt with Blade fighting an evil vampire named Marcus Van Sciver in Detroit, which is also Blade's birthplace in this series. As in the movies, Blade's birth name is Eric Brooks and his mother was named Vanessa. Here Blade's father is Robert Brooks, who raised him until he was 12 and elements of his vampiric nature became more apparent. Marvel Anime: Blade, voiced by Akio Ohtsuka in the Japanese version and by Harold Perrineau in the English dub, while his younger self was voiced by Junko Minagawa in the Japanese version and by Noah Bentley in the English dub. He spends the anime pursuing Deacon Frost (who was responsible for biting his mother) where he uncovers his secret organization called "The Existence". In the past, Eric had to kill his vampire-converted mother in self-defense and was trained in vampire-hunting by Noah van Helsing and Tanba Yagyo. During his training with Tanba Yagyo, Eric met Kikyo Mikage (who was previously seen in Marvel Anime: Wolverine) who was also Tanba's student and defeated him in battle when Eric left Tanba's residence. Blade appeared in the two-part Halloween special Ultimate Spider-Man episode "Blade and the Howling Commandos", voiced by Terry Crews. He is a muscular African-American man with tattoos of ancient runes on his scalp. Blade, along with Spider-Man's team, battles an army of shadow vampires working for Dracula himself. He vows to deliver an ancient, powerful magical relic called Tekamentep's Ankh into the hands of Director Nick Fury at any cost. It is later revealed that he was once a member of Nick Fury's Howling Commandos but left the group. Blade appears in the Hulk and the Agents of S.M.A.S.H. episode "Hulking Commandos", with Terry Crews reprising the role. He appears as a member of the Howling Commandos. On Halloween, Blade is with the Howling Commandos where they are tasked by Nick Fury to apprehend the Agents of S.M.A.S.H. until a threat by Dormammu comes into a view. Blade appears in episodes 42, 43 and 51 of Marvel Disk Wars: The Avengers, voiced by Hiroki Yasumoto. Wesley Snipes as the titular character in Blade film series. In 1998, the New Line Cinema film Blade starred Wesley Snipes in the title role, Kris Kristofferson as Blade's mentor Abraham Whistler, and Stephen Dorff as Deacon Frost. The film was written by David S. Goyer and directed by Stephen Norrington. The film diverges almost entirely from prior comic representations of Blade, completely revamping the character's demeanor, powers, and weaknesses. Traditionally, Blade was often presented as loquacious and boastful, yet in the film he is stoic and nearly silent. Rather than a normal human with immunity to vampirism and vampire hypnosis solely reliant on skill and ruthlessness, he is a superhuman with vampiric powers but none of the inherent weaknesses, with the exception of their thirst. To suppress his thirst, Whistler developed a serum, the original version being implied to be based on garlic and silver. The movie version of Blade is portrayed as an African American born in Detroit, Michigan, whereas the comic-books placed his birth in England. In the Blade TV series, his activities take place in Detroit. Written by Goyer and directed by Guillermo del Toro, a sequel followed in 2002: Blade II. Blade joins forces with vampire overlord Eli Damaskinos to defeat a powerful new breed of vampire called Reapers led by Jared Nomak, revealed over the course of the film to have been the result of Damaskinos attempting to create his own "Daywalkers". The 2004 film Blade: Trinity, written and directed by Goyer, introduced heavily modified versions of Hannibal King (played by Ryan Reynolds) and the Nightstalkers. Blade reluctantly joins forces with the group of vampire hunters led by Abigail Whistler (Jessica Biel), the estranged daughter of his old mentor, to destroy the first vampire, Dracula, who goes by the name "Drake" (Dominic Purcell), simultaneously using him to disperse a virus that kills vampires in the local area and providing Nightstalkers another means against their enemies. In July 2011, Marvel's CCO Joe Quesada revealed that the rights to the character had reverted to Marvel Studios. In May 2013, The Hollywood Reporter reported that Marvel had a script for a Blade feature. In July 2015, Wesley Snipes stated that he had discussions with Marvel to reprise his role. In October 2016, star of Underworld film series, Kate Beckinsale stated that the option of a Blade team-up had been discussed, but declined due to the fact that Marvel Studios has plans to use Eric Brooks/Blade in the Marvel Cinematic Universe. Kevin Feige later stated that there are currently no immediate plans for the character. Blade is playable in Blade (for the PlayStation) and Blade II (for the PlayStation 2 and Xbox). A Game Boy Color game was also produced titled Blade. Blade is an unlockable character in the action role-playing game Marvel: Ultimate Alliance, voiced by Khary Payton. He can be unlocked by playing the crane game in Murderworld which Blade is trapped in. Blade is an unlockable character in the movie-based Ghost Rider video game, voiced by Fred Tatasciore. Khary Payton reprises his role of Blade in Spider-Man: Friend or Foe. He is seen in a costume similar to the Kirk "Sticky Fingaz" Jones version of the character. Spider-Man encounters Blade in Stokerstov, Transylvania decimating the P.H.A.N.T.O.M. troops. Blade informs Spider-Man that he is hunting a creature with eyes like Spider-Man's. Spider-Man figures out that the creature in question is Venom and convinces Blade to let him help. Blade appears in the PS3, PSP and Wii versions of Marvel: Ultimate Alliance 2, voiced again by Khary Payton. Blade appears in the video game Marvel Pinball on Xbox 360 (within Pinball FX 2) and PlayStation 3. Blade appears in Marvel vs Capcom 3: Fate of Two Worlds in Jill Valentine's ending, teaming up with her against an army of monsters. Blade is a playable character in Marvel Super Hero Squad Online. Blade is a playable character in Lego Marvel Super Heroes, voiced by Phil LaMarr. Blade is a playable character in the Facebook game Marvel: Avengers Alliance. Blade is a playable character in the online game Marvel Heroes, voiced by Dave Fennoy. Blade is a playable character in Marvel: Future Fight. There are two playable versions of Blade ("Daywalker" and "Modern") in the match-three mobile game Marvel Puzzle Quest. He was first added to the game in October 2014. Blade briefly appears in the Anno Dracula series story "Andy Warhol's Dracula: Anno Dracula 1978-1979". ^ a b "Gene Colan interview, ''Comic Book Artist'' #13 (May 2001)". TwoMorrows Publishing. 2001-02-18. Retrieved 2011-01-07. ^ Greenberger, Robert (2009). "Inside the Tome of Dracula". Marvel Spotlight: Marvel Zombies Return. p. 28 (unnumbered). ^ "Blade Delayed, For All-New All-Different Marvel". Bleeding Cool Comic Book, Movie, TV News. Retrieved 2015-11-09. ^ a b c Marvel Preview #3 (Sept. 1973). Marvel Comics. ^ a b The Tomb of Dracula #30 (March 1975). Marvel Comics. ^ The Tomb of Dracula #10. Marvel Comics. ^ The Tomb of Dracula #12-14. Marvel Comics. ^ The Tomb of Dracula #17. Marvel Comics. ^ The Tomb of Dracula #19. Marvel Comics. ^ The Tomb of Dracula #21. Marvel Comics. ^ The Tomb of Dracula #24. Marvel Comics. ^ Fear #24. Marvel Comics. ^ Marvel Preview #8. Marvel Comics. ^ The Tomb of Dracula #41. Marvel Comics. ^ The Tomb of Dracula #42. Marvel Comics. ^ The Tomb of Dracula #45. Marvel Comics. ^ The Tomb of Dracula #48 - #53. Marvel Comics. ^ The Tomb of Dracula #54. Marvel Comics. ^ The Tomb of Dracula #58. Marvel Comics. ^ Doctor Strange #67. Marvel Comics. ^ Marvel Comics Presents #64. Marvel Comics. ^ Nightstalkers #1. Marvel Comics. ^ Ghost Rider vol. 3 #31. Marvel Comics. ^ Nightstalkers #2-4. Marvel Comics. ^ Nightstalkers #18 (April 1994). Marvel Comics. ^ Peter Parker: Spider-Man #8. Marvel Comics. ^ Blade #8. Marvel Comics. ^ Civil War #5. Marvel Comics. ^ Blade #12. Marvel Comics. ^ Marvel Comics Presents vol. 2, #5. Marvel Comics. ^ a b Captain Britain and MI: 13 #5. Marvel Comics. ^ Captain Britain and MI:13 #9. Marvel Comics. ^ X-Men vol. 3 #2. Marvel Comics. ^ X-Men vol. 3 #5. Marvel Comics. ^ Mighty Avengers #9 (June 2014). Marvel Comics. ^ Uncanny Avengers Annual vol. 1 #1. Marvel Comics. ^ The Unbelievable Gwenpool Vol. 1 #11. Marvel Comics. ^ Secret Empire: Brave New World #5. Marvel Comics. ^ Avengers Vol. 8 #10. Marvel Comics. ^ "Blade, Fairy Tail, Ro-Kyu-Bu! Promo Videos Streamed". Anime News Network. ^ Marvel Zombies #2. Marvel Comics. ^ Ultimate Spider-Man Super Special #1 and Ultimate Spider-Man #95. Marvel Comics. ^ Ultimate Avengers 3 #1-6. Marvel Comics. ^ New Ultimates vs Avengers #3. Marvel Comics. ^ New Ultimates vs Avengers #1-6. Marvel Comics. ^ a b Dean, Michael (November 2001). "Post Mortem: Marv Wolfman Talks About His Day in Court". The Comics Journal (239). Fantagraphics Books. Archived from the original on May 10, 2008. ^ Dean, Michael (November 16, 2000). "Wolfman loses Blade lawsuit against Marvel". The Comics Journal (229). Fantagraphics Books. Archived from the original on February 24, 2012. Retrieved January 7, 2011. ^ "Blade is number 63". IGN. Retrieved May 14, 2011. ^ "Best Heroes of All Time". UGO Networks. Archived from the original on December 22, 2010. Retrieved May 21, 2011. ^ Buxton, Marc (October 30, 2015). "Marvel's 31 Best Monsters". Den of Geek. Archived from the original on 2018-09-30. Retrieved 2018-09-30. Blade isn't really a monster. In fact, he might be the greatest monster hunter in comics (sorry Buffy). But consider the fact that Blade is part vampire, and you have a heroic bloodsucker worthy of making our top 5. ^ Sherman, Jennifer (October 14, 2011). "Blade English Dub's Lead Cast". Anime News Network. Retrieved 2 January 2016. ^ "Blade, Man-Thing Guest-Star on 'Ultimate Spider-Man' Halloween Special". Comic Book Resources. September 20, 2013. ^ "Hulking Commandos". Hulk and the Agents of S.M.A.S.H. Season 2. Episode 3. October 19, 2014. Disney XD. ^ Kit, Borys; Bond, Paul (May 7, 2013). "A Spago dinner sets the stage for Downey's epic contract talks that could lead to more "Avengers" and "Iron Man 4" — or a new Tony Stark". The Hollywood Reporter. Retrieved May 8, 2013. ^ Patten, Dominic (July 9, 2015). "Comic-Con: Wesley Snipes On 'Blade' Marvel Talks, 'The Player' & Spike Lee – Deadline". Deadline Hollywood. Archived from the original on July 17, 2015. Retrieved July 11, 2015. ^ Hood, Cooper (October 7, 2016). "Kate Beckinsale Says Marvel Is Working On A Blade Project". Screen Rant. ^ Libbey, Dirk. "What's Happening With Blade At Marvel, According To Kevin Feige". CinemaBlend. ^ Denick, Thom (2006). Marvel Ultimate Alliance: Signature Series Guide. Indianapolis, Indiana: Brady Games. pp. 40, 41. ISBN 0-7440-0844-1. ^ "GameSpy: Zen Studios Announces Marvel Pinball - Page 1". Uk.ps3.gamespy.com. Retrieved 2011-01-07. ^ "Blade Joins Marvel Heroes 2015!". MarvelHeroes.com. Gazillion Entertainment. 29 October 2015. Archived from the original on 2016-11-26. Retrieved 25 November 2016. ^ "Marvel Heroes 2016". www.facebook.com. Retrieved 25 November 2016. This is a post on the official Marvel Heroes Facebook page, which is linked to by the game's website at MarvelHeroes.com. ^ Liebl, Lance (October 23, 2014). "Blade, the Vampire Hunter coming to Marvel Puzzle Quest for Halloween". GameZone. ^ "Brad Mengel - Andy Warhol's Dracula Anno Dracula 1978-79 by Kim Newman (1999) in THE MAMMOTH BOOK OF VAMPIRES 2004 edition". My.opera.com. Retrieved 2011-01-07. Blade at Don Markstein's Toonopedia. Archived from the original on February 22, 2018. This page was last edited on 9 April 2019, at 11:30 (UTC).